The 18-hole golf course, measuring 6724 yards offers golfers of all abilities a fair and challenging test. After a gentle start, the holes wind through picturesque scenery, mature woodland and natural water hazards. The driving range is open from 7am to dusk. Every player, whatever their standard, receives a warm welcome at Rusper Golf Club and visitors can play every day. Rusper has memberships available in all categories. The club offers twilight rates throughout the season with reduced green fees on offer for as much golf as can be played after 4pm (2.30pm in the winter) seven days a week. It is advisable to reserve your tee time for this popular offer. Rusper enjoys an informal, friendly and relaxed atmosphere with a warm welcome always waiting in the clubhouse. Green Fees Mon-Fri: £30. Sat-Sun: from £23. Really enjoyed this course, it is tight in places, every hole is different and is a real challenge especially off the white tees. You soon get used to the planes and after a while don't even hear them! It is always well maintained and even in the winter the greens and fairways are always very good. Extremely good value for money and always fun. Everyone from the pro shop to the bar is always polite, open and very friendly, could not ask for more. On the day we went there was a minor problem in the kitchen, but we still got a fantastic breakfast! Love this course. Both, on our arrival it had been raining cats & dogs and we envisaged a puddle strewn round with soggy greens and overflowing ditches. How wrong we were - after a drink & sandwich in the bar - the conservatory, with its plastic roof, intensified the sound of rain - we hit the 1st Tee. First impressions were of a well manicured course, but wide open and apparently straightforward and unchallenging -wrong again. What followed was an amazing venture into course management, rarely have I had to use all my clubs in a round of golf, but I found myself having all sorts of games with various strategies being used to conquer each hole. The course was in superb condition and probably the best greens I had played on this year (I play about twice a week, once a week a different course)and the whole set up was a delight. Bonus of highly visible yardage markers in centre of fairways. Drawbacks - it was impossible not to notice the planes taking off & landing, every 2 minutes - but after a while even they disappeared to the back of my mind as I struggled to hit the perfect approach or read the subtle borrows. Overall an absolute delight, although with a 2-4-1 (£2.50) voucher the Club charge you for the day rate £30, there is little saving to be had as the single round Greenfee is only £20, overall saving for 2 players - £3.75 each (What’s the point !!!). I would definitely return, but would not waste a voucher. Thanks to Paul from 2-4-1's intervention, the voucher issue is now sorted. Played 36 holes today. The course was in superb condition. Congratulations must go to the greenkeeping staff for the condition of the fairways and greens. They were superb. Not really a good course for the novice as tree lind fairways are very narrow on many holes with some dastardly placed ponds lurking. But it is a very good test of golf. Food was quick this time around and very good quality. Janice in the pro shop was very friendly and helpful. What a perfect day! Very pleasant couse meandering through the woods. Easy to walk. If your spraying the ball around it could be a nightmare and cost you a few nightmares. Course was in good condition especially the greens which were very true. Service in the clubhouse was very slow...watched a comlete set at Wimbledon waiting for food to arrive...35 minutes. No ploughmans of any kind om the menu! 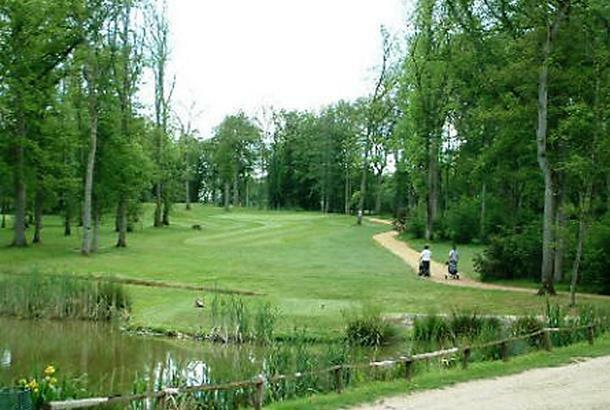 Green fees are £20 unless you are 2-4-1 whereby they increase to £30 meaning a saving of just £5 a player. Day tickets with voucher cost exactly the same as without. Bit of a swiz I reckon! For me this a joy to play, the course is one of those that is a joy to play, it starts nice and open, with a fairly easy Par 4, from then on its just becomes a test of all your skills, it favours those who can hit straight and consistant as when it starts to wend its way through the trees club selection becomes paramount. Being on the flight path to Gatwick ( those planes are low) does have its drawbacks but doesn't spoil a round. The clubhouse could be better and no actual spike bar can be a bit of pain in the winter. But overall i would reccomend this course to all.